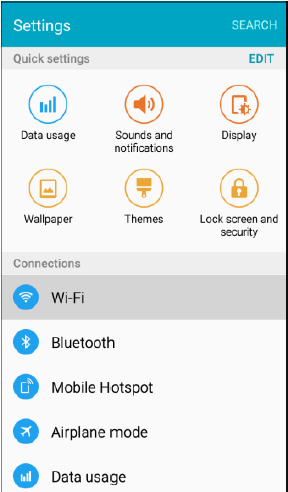 Use the Connections setting menu to enable your phone’s Wi-Fi feature and connect to an available Wi-Fi network. 1. From home, tap Apps > Settings > Wi-Fi. 2. Tap ON/OFF to turn Wi-Fi on. 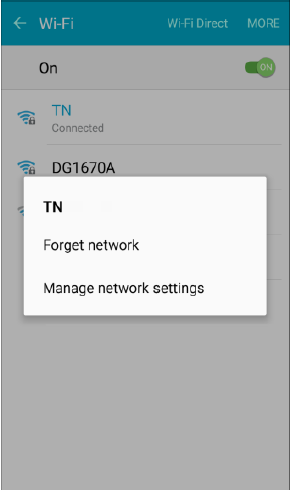 To disable Wi-Fi, tap ON/OFF again. 3. 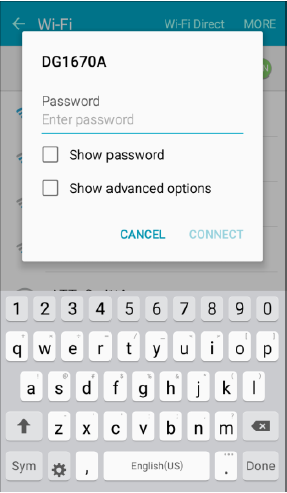 Tap a Wi-Fi network to connect, enter the password (if it is not an open network), and then tap Connect. Your phone is connected to the Wi-Fi network. You will see in the status bar. The password, for a household wireless LAN router, is sometimes found on a sticker on the router (WEP, WPA, KEY, and more). Contact the router manufacturer for information. For password for a public wireless LAN, check with the user's service provider. How do I connect my S5 Neo to my TV using screen mirroring?